The Eucharist grants us communion with Christ, who is truly present in the Sacrament, body, blood, soul and divinity. The Eucharist renders present to us the grace of the Pascal Mystery, unites us with the whole body of the Church, restores spiritual strength, nourishes faith, encourages hope, empowers charity, protects against temptation, washes away venial sin, fortifies us on our earthly pilgrimage and grants us a foretaste of heaven. 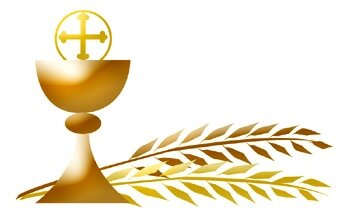 The Eucharist is celebrated in the parish everyday, Monday-Saturday at 8:00 AM. Celebrations for Sunday begin with the 4 PM Vigil Mass on Saturday afternoon and continue on Sunday at 8:00 AM, 10 AM and 11:30 AM. Holy Days of Obligation have Mass schedules particular to the day. Solemn Adoration of the Blessed Sacrament takes place in the Church every Friday from Noon until 5:30 PM, closing with Evening Prayer and Benediction. On the First Friday of every month Adoration begins immediately following the 8 AM Mass. Children are prepared for their First Holy Communion in the second grade through the Religious Education Program. Teenagers and Adults are prepared for their First Holy Communion through the RCIA Program. Come join us in communion around the Lord's Table.